By the end of the 16th Century, accompanying the changes occuring in painting and sculpture were advances in musicianship and theatrics. One particular event has survived the ages, and has gone onto become a highly cherished and sought after contemporary performance. 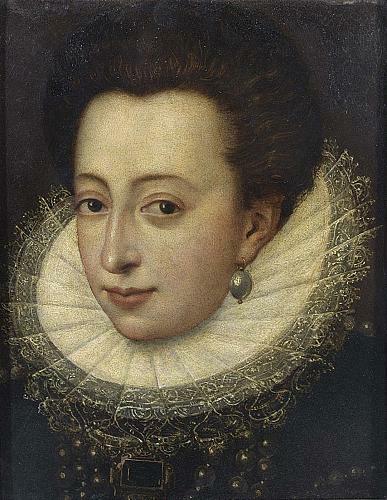 This is the story of Ferdinando and Christina, and Una Stravaganza dei Medici. Portrait of Ferdinando as Grand Duke. The Medici who served as Grand Dukes of Tuscany were distant relatives to the Medici we know as famous patrons from the 14th Century. In 1737, The Medici line ended with the death of Gian Gastone de' Medici. Ferdinando I de' Medici (1549-1609) served as Grand Duke of Tuscany between 1587 to 1609, and had previously served as Cardinal from 1569, a title which he relinquished upon his marriage in 1589. The wedding of Ferdinando to Christina of Lorraine (1565-1637) is celebrated as one of the greatest Court Weddings in recorded history. We are told of numerous festivities and banquets, including the flooding of the courtyard of the Palazzo Pitti for mock sea battles, or naumachia. Part of the celebrations involved performance of the five act play La Pellegrina (The Female Pilgrim) by Girolamo Bargagli (1537-1586). Surrounding these five acts were six Intermedi, which were interludes depicting separate tales from Mythology. The Intermedi designed for the 1589 wedding was a spectacular affair, engineered to impress the aristocracy of Europe who were in attendance. 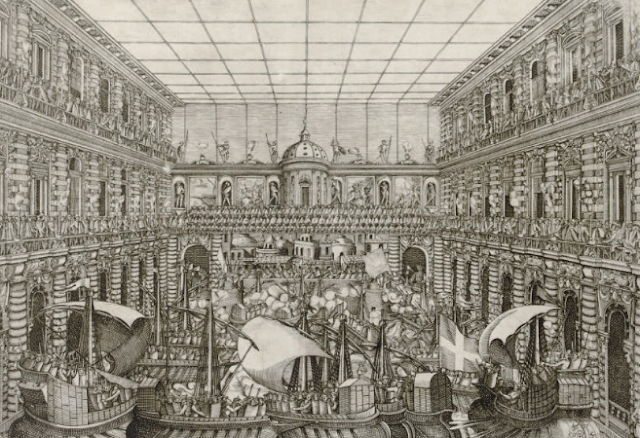 The Intermedi were primarily written by Christofano Malvezzi (1547-1599), and included elaborate mechanical sets designed by Bernardo Buontalenti (c.1536-1608) which took over a year to construct. 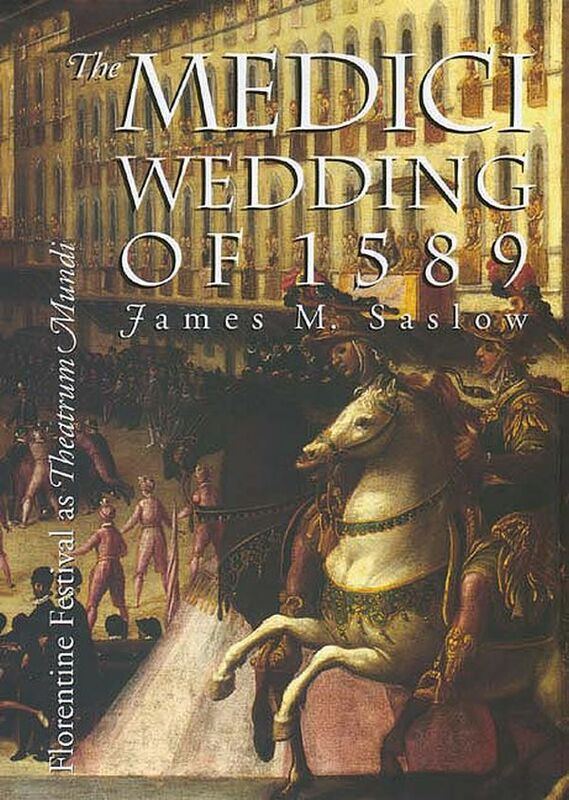 If you are interested in reading more about this form of Renaissance performance, A.M Nagler's Theatre Festivals of The Medici 1539-1637 (pub. 1976) is a wondrous read. Nagler's book is a rare gem, an absolute must for fans of Renaissance history and music. Highly recommended is this more recent title on the subject, James M. Saslow's The Medici Wedding of 1589 - Florentine Festival as Theatrum Mundi (pub.1996). Festival Books survive which display the spectacle via engravings. 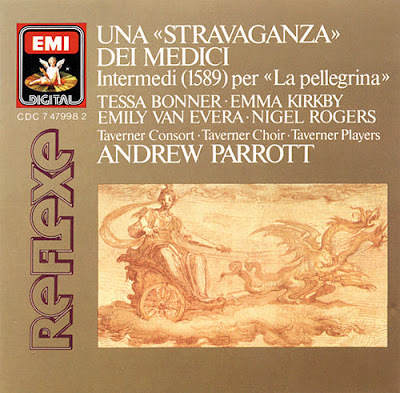 The music for La Pellegrina and the Intermedi are also largely intact - and was used in the recreation of this amazing performance for a Channel 4/ Thames TV and NHK Japan Co-Production in the mid 1980s. The musical performance was conducted by Andrew Parrot and featured the world's most eminent period musicians and singers, including the celebrated soprano, Emma Kirkby. A limited release CD is still available for purchase, but a DVD of the production never eventuated. The costume and stage design recreated the amazing spectacle that observers of the 1589 Medici wedding would have experienced. Thanks to some diligent lovers of Renaissance Music - we can view the elusive performance online. Enjoy! The complete Intermedi - In 8 parts on youtube courtesy of lalagonegaga. This performance is not available for purchase so if you really enjoy it, I recommend tracking down the audio CD. oh dear, i wish i had seen this before i designed my wedding last year. i had to make due with a leviathan made of fome-cor. Hello Lynne. Welcome to 3PP. A leviathan is a decent effort, especially if you didn't have the combined budget of the Medici and House of Lorraine! Yes please publish the DVD! Had the performance on video but lost it. Still have the cd! This music is really fabulous and the great performance gives you the idea you're with the Medici's. So beautiful. We had 'O Fortunato Giorno' arranged for a 10 part choir to sing as my wife (to be) entered the church and walked up the aisle at our wedding last month. It was magical. Just this last weekend we were also able to attend the complete performance of the Intermedi at the Brighton Early Music Festival. This has long been a favourite work for me and one that more people should have the opportunity of experiencing. have been removed! I wish I could see the whole thing!